In Need Of A Gluten Free Ingredient? There's An App For That! Have you ever been in the middle of preparing a delicious meal when you realize that you're missing a key ingredient? Well, when you're on a gluten free diet fixing this scenario can be more difficult than a quick trip to the local grocery store. You may need to visit several grocery stores before you can find a gluten free version of this ingredient. 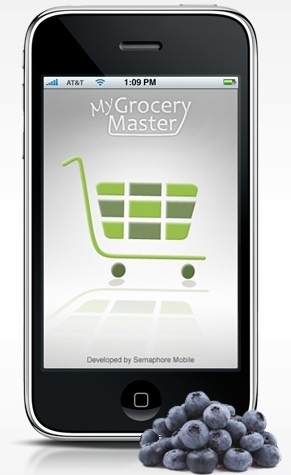 Thankfully, My Grocery Master has created an app that will help alleviate this problem. All you have to do is enter your zip code and the product that you are looking for and it will scan its database of the top 100 grocery store chains in the country to find the nearest store that carries the item you are searching for. And not only does it work for those of you on a gluten free diet, but it also works for other specialty diets such as a kosher or lactose-free diet and upcoming updates will include searches for vegan, organic, and diabetic-suitable diets. The application is relatively cheap at $4.99/year with free updates as new products and brands are added. And this application is compatible with the iPhone, iPod Touch, and the iPad. I decided to give the app a try on my iPhone. I entered my zip code and decided to run a "gluten free" search for "cake." The following 2 products came up: Flourless Chocolate Cake and New York Deli Style Baked Cheese Cake. Both of these items were availabe at the Trader Joe's around the corner from where I live. And for added convenience you can also save your searches in case you're looking for the same item again! For more information, please visit MyGroceryMaster.com or the App Store at the iTunes Store! Let's Bake Some Corn Muffins! Today I decided to try out a recipe for corn muffins and alter it so that they were gluten free. The muffins turned out to be delicious! Now, all you have to do is combine the above ingredients in a large mixing bowl. Once thoroughly mixed, spoon onto a paper-lined or greased muffin tray. Bake for 15-20 minutes at 400 degrees Fahrenheit.